Are you missing a few teeth—or all of them? You’re probably worried about how your impaired smile affects your social and work connections, not to mention how those unfortunate gaps impact your dental health. Patients with missing teeth suffer from TMJ disorders, slurred speech, poor eating habits, bad alignments, and increased risk of gum disease. Studies have shown that smiling impacts your mental and physical health. Did you know offering a sincere smile can instantly improve your mood, decrease stress, and boost immunity? You don’t have to settle for a less-than-whole smile! At the Plano office of Dr. Bunday, we can restore your smile with affordable tooth replacement options. When it comes to choosing your tooth replacement, we must consider several factors. Dr. Bunday will assess your overall oral health, and determine any necessary pre-treatments such as periodontal therapy or root canals. Creating a tooth replacement plan depends on the location of the missing teeth, the condition of your oral health, and your smile goals. 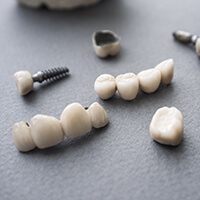 Some of our tooth replacement options include crown and bridge, partial dentures, or full dentures. We create these dental prosthetics so that the acrylic base matches your gums, and the porcelain crowns look like your natural teeth. Another option for tooth replacements is putting in dental implants. No matter which tooth replacement option you choose, you can rely on Dr. Bunday to take care of you at his Plano restorative dentistry practice.